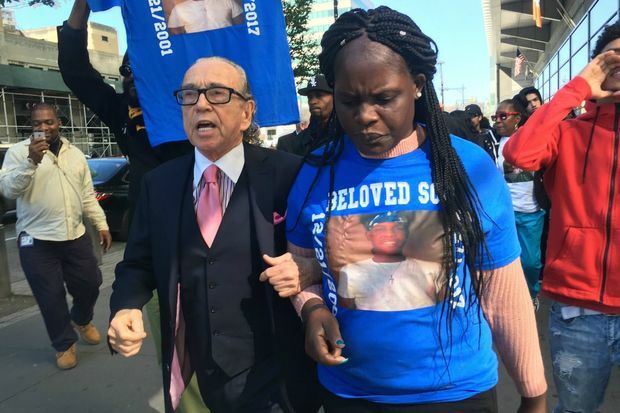 Louna Dennis, Matthew McCree's mother, marches with lawyer Sanford Rubenstein outside the Bronx Hall of Justice on Oct. 17, 2017. CONCOURSE — The mom of the Bronx teen fatally stabbed by a classmate last month intends to file a $25 million lawsuit against the city, claiming school administrators and police security failed protect her son, her lawyer announced Monday. The lawyer for Louna Dennis, the mom of the slain 15-year-old Matthew McCree, said that a combination of a lack of metal detectors in a dangerous school, ignoring bullying protocols and poor supervision lead to the boy's death. “There was a recipe for disaster at the Urban Assembly School For Wildlife Conservation," said Sanford Rubenstein, the lawyer representing the family of the student who was killed as well as the teen who survived the attack, Ariane Laboy. Abel Cedeno, 18, was arrested on Sept. 27 for stabbing McCree to death and wounding Laboy. Police said the two had been throwing pencils at Cedeno during history class. McCree's family denied there was any harassment and maintained that he was not a bully, but Cedeno claimed that he had been the target of anti-gay bullying for years and has said that he "snapped" before stabbing his victims. In her notice of claim, filed last week, Dennis charges that "inept and incompetent school safety agents, teachers and other school personnel ... failed to protect the students," and instead allowed the incident that ended in her son's death to escalate. She claims there was insufficient staff "in light of known dangerous conditions" at the school and that the educators neglected to follow the law for how to deal with complaints from Cedeno about being bullied. Laboy, who also plans to file a lawsuit against the city, is seeking compensation for personal injuries, emotional distress and medical expenses, among other damages. His notice to sue, filed through his father, says the teen was stabbed numerous times in the torso, lungs, chest, shoulders, arms and other parts of the body, leaving him with injuries including a punctured right lung and nerve damage. He claims that school employees could not "control students" and both victims' families blamed the lack of metal detectors at the school for the incident. "This was a tragic incident. The City will review the legal papers," a spokesman from the city's Law Department said.